Colchicum – A Fall Gem | Faddegon's Nursery, Inc. Many folks are unaware of wonderful flowering bulbs for fall color. Yup, I said fall. There is a fall blooming Crocus as well as a crocus look-alike called Colchicum. These delightful flowers pop up in September and October on 4”-8” wiry stems, ‘sans’ leaves. The leaves actually appear in the spring and then go dormant; they’re the opening act to the fall show. Flower colors range from white, lavender, pale pink, and rosy-mauve. Colchicums have a larger, showier flower than Crocus. Both prefer full sun to partial shade and well-drained soil. They work well tucked in among lower growing ground covers such as Creeping Sedum, Sweet Woodruff (Gallium), Snow-in-Summer (Cerastium), or Creeping Yellow Jenny (Lysimachia). These bulbs are planted in late summer. 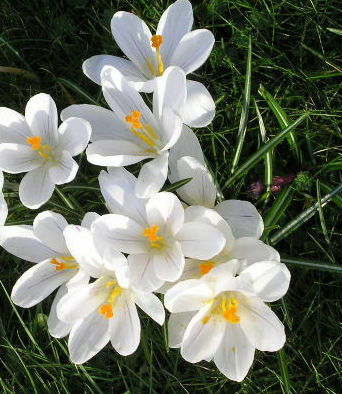 We still have the pure white Colchicum and lavender-blue Crocus available at Faddegon’s, as of this blog. An extra perk for Colchicums is that their bulbs are poisonous and critters smartly leave them alone. Be careful! Colchicum may trick you into thinking summer is still ahead – but the dropping temperatures will quickly bring you back to reality!